Why we need medicinal plants in our daily routine? The questions comes in our mind when we see any plants with good cure. So tree like Neem , plant like pudina has medicinal uses hence we need to make plantation for that. And also Plants like Parijatak , Desibadam , Kunti has their medicinal properties in another term like bottel palm , bottle brush has show plants. Such Plants like Pichkari we can find at road site. But if you need to do more creativity then go for saptparni and gulmohar tree. 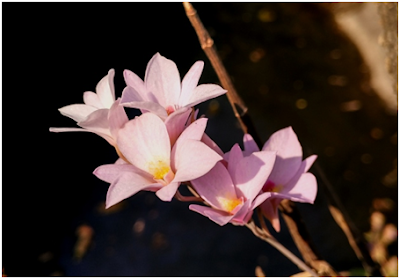 Botanical name : Flemingia strobilifera (Linn.) Ait. & Ait. Distribution : India, Sri Lanka, China, Yunnan, Burma, Malaya, Java, Thailand. Description : Shrubs, 1–2 m high. Leaves simple, alternate, ovate–lanceolate or oblong, silky pubescent beneath, apex acute, base rounded. Flowers in axillary and terminal racemes. Pods oblong, mucronate, densely pubescent. Seeds 12, dark–brown or black. Medicinal uses : Roots are used in epilepsy, hysteria and to induce sleep; pounded roots are given in fever. The leaves are used as a vermifuge for children. 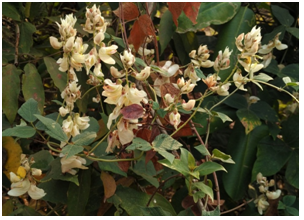 The Marma tribe uses this plant as fly repellent; decoction of the leaf is taken orally by them to cure body swellings due to cessation of menstruation; bath taken with leaf-boiled water has similar effect. The plant is also used for rheumatic fever. Description : Trees, 4-10 m high, much branched, often with well spreading canopy; bark greyish-white or pinkish, smooth. Leaves simple,alternate, ovate-oblong, elliptic-lanceolate, base cuneate or rarely subcordate, apex subacute or subacuminate, entire, subcoriaceous. Figs in large clusters on the main branches and trunks, c 3 cm across, obovoid, pyriform, pale green to red to purplish on ripening. Seeds c 1 mm long, lenticular, smooth. Medicinal uses : The fruits are considered astringent, stomachic and carminative; given in menorrhagia, haemoptysis, bronchitis, dry cough, diseases of kidney and spleen. The unripe fruit is astringent to the bowels, tonic and styptic; allays thirst, useful in leucorrhoea. 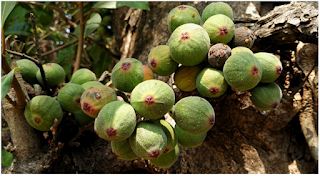 The ripe fruit is acrid and cooling; useful in biliousness, burning sensation, fatigue, urinary discharges, thirst, leprosy, menorrhagia and nose bleeding. Description : Twiners, extensive; stems and branches woody, finely downy or tomentose. Leaves trifoliate, alternate; Leaflets 3, terminal rhomboid, laterals obliquely ovate, velvety pubescent, apex acute, base rounded. Flowers yellow, in axillary peduncled racemes. Pods oblique, downy, 1–seeded. Medicinal uses : Used in epilepsy and to induce sleep. The fruit is acrid and bitter, improves taste, appetizer, and astringent to the bowels. 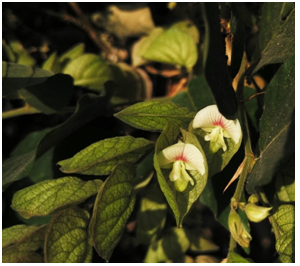 The plant enriches the blood, cures biliousness, liver disorders and “kapha”. It is good for throat troubles, causes flatulence. The root is useful for treating dysentery and leucorrhoea and also applied externally along with other drugs to reduce tumors. Botanical name : Dendrobium barbatulum Lindl. Description : Epiphytic herb, Stem 5-10 cm long, leafless when flowering. Flowers creamy white to bluish-pink, in about 5.8 cm long terminal 5-6-flowered racemes; petals obovate, obtuse, 7-veined; lip 3-lobed, side lobes ovate, obtuse, midlobe obovate, truncate at apex, disc with an oblong callus and yellow hairs. Medicinal uses : Extract obtained form pseudobulbs is administered orally to treat stomach-ache and improve digestion.